The Festival Players Theatre Company bring their outdoor summer tour of Shakespeare’s Hamlet to the Brighton Open Air Theatre (BOAT) on Thursday, August 31. Spokeswoman Su Gilroy said: “This year is the 400th anniversary of the death of the nation’s (arguably the world’s) greatest playwright, William Shakespeare, and The Festival Players Theatre Company is proud to present his most famous play, Hamlet. 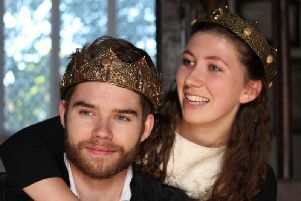 This theatre company from Gloucestershire, which has been touring professional outdoor Shakespeare productions for over 30 years, is taking the play across the UK and into Europe. “Presented in full costume, an all-male company brings the excitement of this great thriller: intrigue, ghostly visitations, passion, a play-within-a-play, a gripping duel, and humour, in a crystal-clear and fast-paced two-hour production. Festival Players Artistic Director Michael Dyer has reduced the play to two hours. He said: “Our shows are an amalgam of energy, entertainment and colour, and we aim to make them clear and transparent, as well as keeping them short for the comfort of our patrons. We set out to take audiences of all ages on a journey and make them feel very much part of the production. Last year The Festival Players toured As You Like it and Henry IV and many of those actors have returned this year. The title role of Hamlet will be played by Benjamin Way, who was Rosalind in As You Like It and Poins, Justice Shallow and Prince John in Henry IV. Mark Spriggs was Falstaff in Henry IV and Touchstone in As You Like It, and this year will play Claudius. Joel Daffurn, who has been with the company since 2013, will play Laertes, Guildenstern and the First Player, and taking the roles of Polonius, Gravedigger and Second Player is Paul Mills, also with the company since 2013. Michael Dyer himself will play the part of the ghost of Hamlet’s Father. Newcomers to the company this year are Lee Peck and Jonny James-Jones, both of whom trained at East 15 Acting School. Lee Peck will be playing Gertrude and Horatio and has previously played Romeo in Romeo & Juliet and Bottom in A Midsummer Night’s Dream for the Young Shakespeare Company, and was Malcolm in a radio production of Macbeth. Jonny James-Jones will be playing Ophelia, Rosencrantz and Osric.